Over the last twenty years or so, palaeontologists studying the Late Cretaceous fauna of North America have discovered an amazing variety of Ornithischian dinosaurs in strata laid down between 80 million and 70 million years ago. A number of horned dinosaurs such as Vagaceratops, Utahceratops and Kosmoceratops as well as a number of new genera of Hadrosaurs (duck-billed dinosaurs) have been described from western North America. Most palaeontologists have been focused on mapping the faunal distribution and studying the myriad of new plant-eating dinosaur species that have been found, but a number of scientists are now turning to the mystery of why so many different types of dinosaur evolved in this part of the world during the last few million years of the Cretaceous. For one team of researchers based at Ohio University, the explanation as to dinosaur diversity lies in the geology. 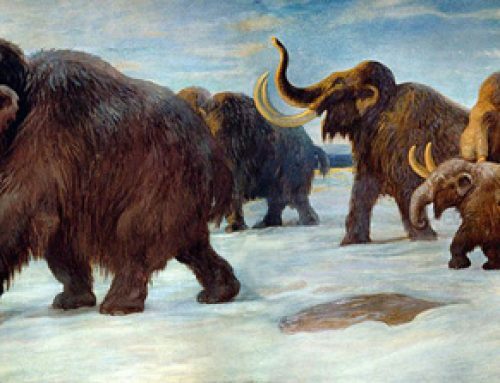 The rise of the Rocky Mountain range and the appearance and then disappearance of a huge, inland seaway that split North America into a series of islands, may have been the catalysts for an explosion in megafauna diversity. The research team from the University’s Heritage College of Osteopathic Medicine have had their paper published in the on line scientific journal PloS One (public library of science). They state that the rapid changing geology led to populations of animals being isolated which may explain the patterns of evolution, migration and rapid dinosaur diversification. The presence of different dinosaur faunas in different parts of North America is referred to as provinciality by Everything Dinosaur team members. The research team set out to examine the geological record of what was to become the continent of North America, focusing on the United States and Canada. During the Campanian faunal stage of the Cretaceous, a time in the Earth’s history that roughly relates to 83 million years ago to 74 million years ago there was extensive plate tectonic activity that led to mountain ranges being pushed up and the sinking of much of the continental landmass under an inland sea (known as the Western Interior Seaway). At its most extensive, this seaway covered much of North America from Canada to the Gulf of Mexico. In the later Maastrichtian faunal stage, that lasted from 74 million years ago up until the mass extinction event 65 million years ago, there was less extensive plate activity. This coincided with a decline in the number of genera of dinosaur known from the fossil record. Palaeontologists have interpreted this as evidence as a fall in the number of dinosaur species living in North America towards the very end of the Cretaceous – dinosaur genera became less diverse. The diagram above illustrates the diversification of the horned and duck-billed dinosaurs during the Late Cretaceous. Scientists postulate that this rapid speciation occurred as a result of high sea levels and mountain formation. The geologic time scale is to the left of the diagram, with horizontal green divisions representing the Campanian (lower) and Maastrichtian (upper) time periods. Silhouettes of North America demonstrating areas covered by ocean water during each of the time periods are to the right along with triangles designating the relative size of both the Western Interior Seaway and the Laramida mountain range. Finally, the fork within the duck-billed (black) and horned (grey) dinosaur family trees show the coinciding time (yellow bar) of a major split within each group of dinosaurs. Geologists have calculated that during the Early Cretaceous there was a substantial amount of geological activity in the western United States. A number of processes involving subduction, the movement of ocean crust down into the Earth’s mantle occurred along what was to become the western coast of North America. These immense geological forces caused the western part of the Americas to be lifted up and this led to the formation of an enormous mountain range that extended from Alberta (Canada) in a south-western direction to as far south as the southern United States. The region to the east of this newly formed mountain range (the Sevier Mountains), flexed downwards and this coincided with a rise in global sea levels, flooding much of the continent and splitting what land remained above sea level into a series of large islands. This sea (Western Interior Seaway), teemed with life and the marine deposits left behind in places as far apart as Alberta and Kansas have provided palaeontologists with an amazing variety of marine reptile fossils to study – Dolichorhynchops, Elasmosaurs and huge Mosasaurs such as Tylosaurus. The Ohio based research team have focused on the dinosaur fossils that have been found in association with the islands. At its most extensive, the Western Interior Seaway split the North American land mass into three large islands. These islands each had a substantial and diverse population of Ornithischian dinosaurs. The most western of the islands, known as Laramidia consisted of land that was to form Alberta in the north with the American states of Dakota and Montana in the middle with the land that was to become Utah forming the southern part of the island. Formations laid down in the north of this island, the famous Dinosaur Provincial Park for example, have provided palaeontologists with a huge range of horned and duck-billed, Ornithischian dinosaurs. Fossils found in Utah, animals such as the horned dinosaurs Kosmoceratops and Utahceratops from rocks of roughly the same age, indicate that different types of plant-eating dinosaur evolved in the south. The Ohio University scientists have postulated that mountain building and the rising sea levels caused the available habitat for dinosaurs to shrink on Laramidia. Populations became isolated and this was further compounded by later plate tectonic movements that led to the nascent development of what was to become the North American Rockies. The team postulate that a new species of large, Ornithischian dinosaur evolved every few hundred thousand years during the time that the mountain ranges and the Western Interior Seaway isolated populations. These geological processes led to a rapid burst of dinosaur evolution in these cut-off populations, in the same way that the isolated populations of animals in the Galapagos archipelago rapidly diversified into new species. The maps above show North America 75 million years ago, with the Western Interior Seaway cutting the land mass into a series of islands (A). This is compared to the continental land mass approximately 65 million years ago with the seaway having retreated. However, this extensive speciation of mega-herbivores was brought to an end with the continued rise of the embryonic Rock Mountains which eventually forced the Western Interior Seaway to contract. This opened up a large, open territory for the Ornithischian dinosaurs to exploit. This reduced the turnover in species with new species evolving at a much slower rate. New species taking more than a million years to evolve. The research team warn that their work on the major, herbivorous dinosaur faunas of North America cannot be used as a template to explain the rise and then the decline in dinosaur diversity on a global scale. However, the rapidly changing geology caused by plate movements would have had an influence over the migration of dinosaurs from the Americas into Asia and into South America. The rise of the Rocky Mountains for example, would have created a barrier that the dinosaurs could not cross. Only dinosaur species resident north of this barrier could have migrated into Asia and only those species living in the southern part of Laramidia would have had a migration route open to them to South America. It is also worth noting that a long, thin island such as Laramidia would have had different climates. The most northerly part of the island was at a much higher latitude than the southern parts. This may have encouraged different vegetation to flourish and this too, might help to explain the diversity of herbivorous dinosaurs in the region, with each species adapting to exploit a particular niche in the eco-system. Everything Dinosaur acknowledges the help of Ohio University in creating this article.